Portable Stress Analyser | OhGizmo! I can’t find the actual product on their website, but then again, I’m not trying very hard. 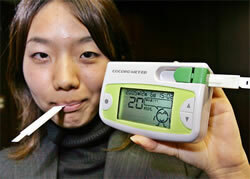 So, according to Ubergizmo, it seems that Japanese company Nipro has developed a portable stress indicator. The device works by analysing amylase levels in your spit saliva. It seems the level of amylase increases whenever a person is under physical or mental strain. The results are then displayed in a presumably easy-to-interpret fashion, which apparently involves a little stick figure. It’s about $160, and at that price, it’s almost tempting to buy, if only to have a geeky confirmation of what you probably already know.